The metals of gold, silver and platinum have been labeled precious for their remarkable ability to hold their shape, resist tarnish and damage from chemicals. Gold has a long and exotic history. It was one of the first metals discovered and put to use by the human species. Through the centuries people have used it for both jewelry and money. Today gold mining is an important industry in many parts of the world. The yellow or white metal is rarely used in its pure form. It is usually combined with one or more metals to form a harder alloy. This makes it more durable in jewelry and other objects of beauty. Gold jewelry should be stamped with a karat mark; a karat is 1/24 of the total weight of the alloy. Pure gold is 24 karats. For example, an 18-karat gold ring has 18 parts gold and six parts alloy. Karat gold jewelry should be stamped with a karat mark. Oftentimes it is also stamped with the manufacturer’s registered trademark and the country of origin. Gold is a metal prized for its beauty, usefulness, and scarcity. It is one of the easiest metals to shape and can be beaten into thin sheets, more so than any other metal. More functionally, it won’t rust or tarnish. Gold’s chemical symbol, Au, comes from aurum, the Latin word for shining dawn. Is the third of the three precious metals. It is white in color. The standard for sterling silver has remained unchanged since 1300 when Edward I of England established an early trade practice rule for silversmiths. He decreed that sterling silver must consist of 92.5 percent pure silver alloyed with 7.6 percent copper. The term “sterling” refers to the composition of the metal, never to the weight of a finished item. 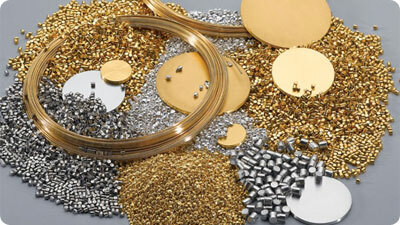 Platinum is the most valuable and rare of the three precious metals. It is silver-white in color. Platinum weighs about 21 times as much as an equal quantity of water, so it is also one of the heaviest substances known. Its strength, hardness, color, and freedom from tarnish make it ideal for gem settings, especially fine colorless and near-colorless diamonds. The Italian scientist Julius Scaliger discovered platinum in 1557. The ore usually occurs in beds of gold-bearing sand. South Africa is the leading platinum producing country. Other producers include Canada, Colombia, Russia, and the United States. © 2017. JL Jewelers. All Rights Reserved.